Too many publications answer to this question by introducing some set of practices or principles considered to be best or at least good. The quality of the architecture is then measured by the number of best practices it adheres. Such a definition might work well for student assignments or in some academia or other non-business settings. In software business, everything you ever spend time or efforts on, must be reasonably well related with earning money, or at least with an expectation to earn or save money. Therefore, in business, software architecture is a roadmap how to achieve functional requirements, and non-functional requirements, such as run-time performance, availability, flexibility, time-to-market and so on. Practices and principles are just tools that may or may not help achieving the goals. By deciding, which principles and practices to use, and which tools to ban, a software architect creates the architecture, and the better it is suited for implementing the requirements, the better the architecture quality is. Like everything in the nature, good things don’t appear without an equivalent amount of bad things. If some particular software architecture has a set of advantages helping it to meet requirements, it has to have also a set of drawbacks. In an ideal world, software architect is communicating with business so that the drawbacks are clearly understood and strategically accepted. Note that any architecture has its disadvantages. The higher art and magic of successful software development is to choose the disadvantages nobody cares about, or at least can live with. For already implemented software, the architecture can be “reverse engineered” and the advantages and disadvantages of that architecture can be determined. And here is the thing. Implemented software is something very hard to change, and so its architecture. Thus, the set of advantages and disadvantages remains relatively stable. But the external business situation or even company’s strategy might change, and change abruptly. Features of the architecture that were advantages before, might become obstacles. Drawbacks that were irrelevant before, might become show stoppers. The software architecture quality might change from being good to being bad, in just one moment of time, and without any bit of actual software being changed! Here are two examples of how different software architectures can be. This is for an abstract web site that has some public pages, some protected area for logged-in users, some data saved for users, a CMS for editorial content and some analytics and reporting module. 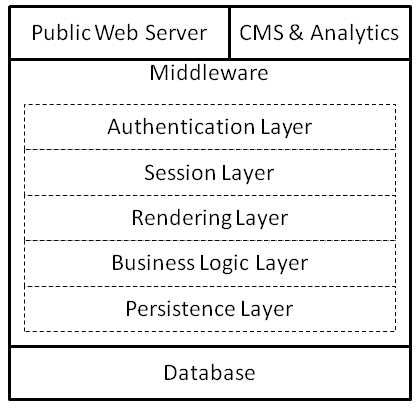 On the server side, there is a database, a middleware generating HTML, and a web server. When a HTTP request comes, it gets routed to a separate piece of middleware responsible for it. This piece uses an authentication layer (if needed) to determine the user, the session layer to retrieve the current session from a cookie, persistence layer to get some data from the database (if needed), and then renders the HTML response back to the user. Because of these tight dependencies, the whole middleware runs as a single process so that all layers can be immediately and directly used. If AJAX requests are made, it is handled in the same way on the server side, except that JSON is rendered instead of HTML. If the user is has to input some data, a form tag is used in HTML, which leads to a post to the server, which is handled by the server-side framework “action” layer, extracting the required action and the form variables. The middleware logic writes then the data into the database. CMS writes editorial data in the database, where it can be found by middleware and used for HTML rendering. A SQL database is used, and tables are defined with all proper foreign constraints so that data consistency is always ensured. Because everything is stored in the same database, analytics and reporting can be done directly on production database, by performing corresponding SQL statements. This architecture is directly supported by many web frameworks and CMSes. Very easy to code due to high code reuse and IDE support, especially for simple sites. Extremely easy to build and deploy. The middleware can be build as a single huge executable. Besides of it, just a couple of static web and configuration files have to be deployed, and a SQL upgrade script has to be executed on the database. No need for a separate analytics DB. Because of the monolithic middleware, parts of the web site cannot be easily modified and deployed separately from each other. Every time the software gets deployed, all its features have to be re-tested. On highly loaded web sites, when using the Web 1.0 model, substantial hardware resources have to be provisioned to render the HTML on the server side. If AJAX is introduced gradually and as an after-thought, the middleware often continues to be responsible for HTML rendering, because it is natural to reuse existing HTML components. So that the server load doesn’t decrease. Each and every request generates tons of read and write SQL requests. Scaling up a SQL database requires a very expensive hardware. Scaling out a SQL database requires very complicated and non-trivial sharding and partitioning strategies. The previous two points lead to a relatively high latency of user interaction, because each HTTP request, on a loaded web site, tends to need seconds to execute. Web server is configured to deliver static HTML files. When such a static page is loaded, it uses AJAX to retrieve dynamic parts of the user interface. CMS generates them in form of static html files or eg. mustache templates. The data for the user interface is also retrieved with AJAX: frontend speaks with web services implemented on the server side, which always respond with pure data (JSON). One service for each part of the web site. For example, if we’re making a movie selling site, we need a movie catalog service, a movie information service, a shopping cart service, a checkout service, a video player service, and maybe a recommendation engine service. Each area of API is implemented as a separate web application. This means, it has its own middleware executable, and it has its own database. Yes, I’ve just said that. Every web service is a fully separate app with its own database. In fact, they may even be developed using different programming languages, and use SQL or NoSQL databases as needed. Or they can be just 3rd-party code, bought or used freely for open-source components. If a web service needs data it doesn’t own, which should be per design a rare situation, it communicates with other web services using either a public or a private web API. Besides, a memcached network can be employed, storing the session of currently logged in users that can be used by all web services. If needed, a separate queue such as RabbitMQ can be used for communication between the web services. UI changes can be implemented and deployed separately from data and logic changes. Different web services can be implemented and deployed independently from each other. Less re-testing is required before deployment, because scope of changes is naturally limited. Different parts of the web site can be scaled independently from each other. Static files and data-only communication style ensure lowest possible UI latency. This is especially true for returning users, who will have almost anything cached in their browsers. Build and Deployment is more complicated: at very least, some kind of package manager with automatic dependency checking has to be used. Middleware code reuse is more complicated (but still possible). Data might get inconsistent, and software has to be developed in a way it can still behave in a reasonable and predictable way in case of inconsistencies. AJAX support on the client side is a requirement. A separate data-warehouse or at least a SQL mirroring database is required to run cross-part and whole-site analytics.